Check out the cards I'm offering on COMC. 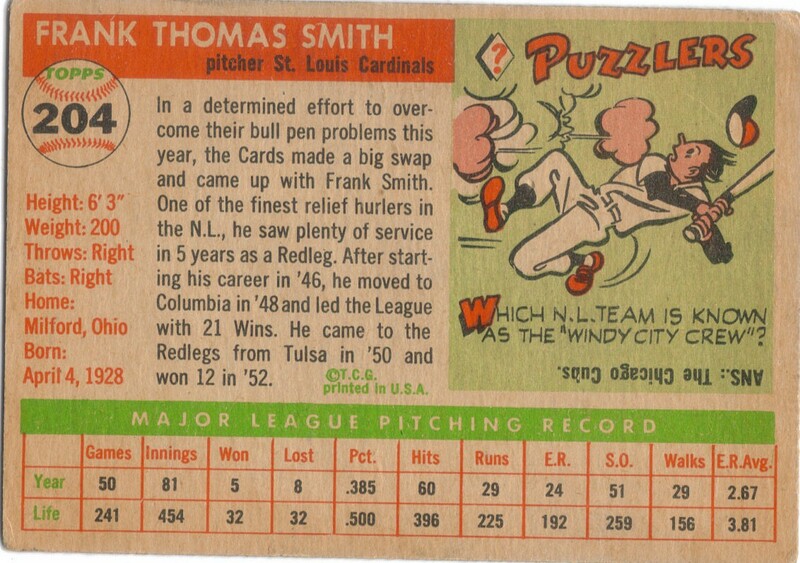 I picked up this card at my former card shop when a guy came in looking to unload some cards. I think he was in a financial bind, so he was willing to sell me this card for only $50. I think I did a heck of a job on this one, if I do say so myself. As you can see, the card isn't in mint condition, but it looks good and I believe I got a good deal. The best part was going to my brother's house later that night and showing him the rookie card of one of his favorite Red Sox players. I'm not the type who gloats, but i couldn't help it with this card. 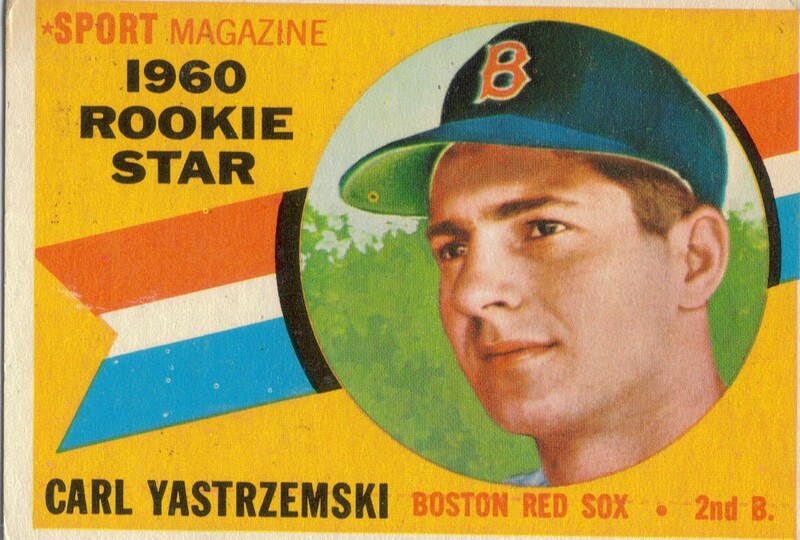 Getting a Yastrzemski rookie this easy was nice. I need to try to get some more RCs of hall of famers, but I'm so hung up on getting their autographs on baseballs. Oh well, I think I have time. 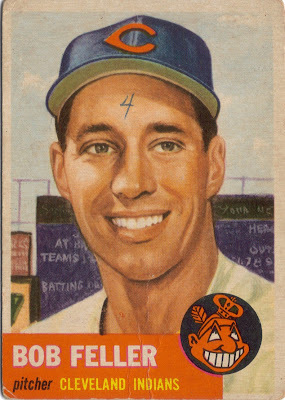 First of all, I'd like to slap whomever wrote the 4 on Bob Feller's forehead. 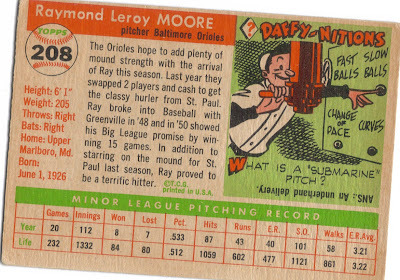 To me, one of the cardinal sins of baseball card collecting is writing on a card. I can't stand it. 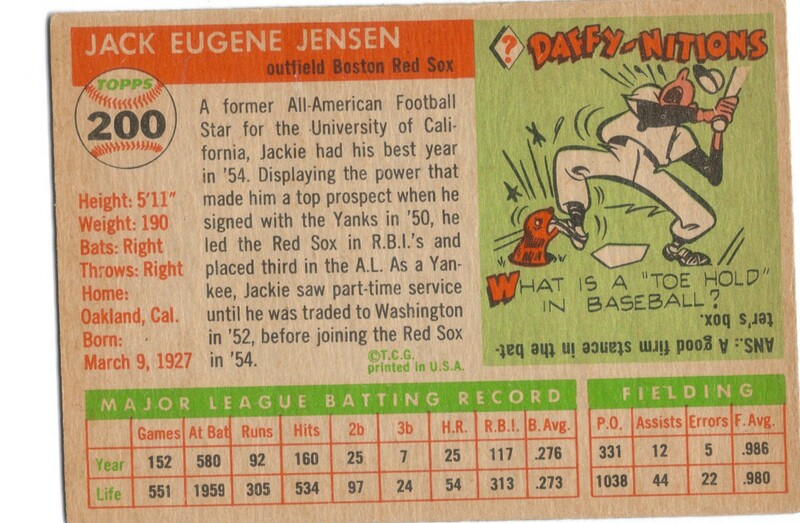 However, this card does have a good bit of 'character.' 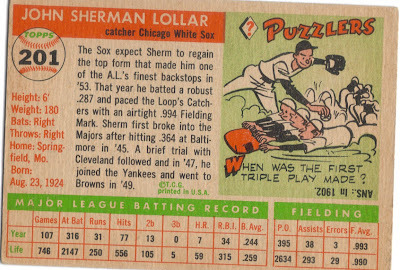 I have been looking for the '53 Feller for some time now, and when i saw this one, I added it to a stack of cards that I was purchasing from a regular vendor of mine. When he added the prices up of everything, he told me that he threw this one in for free since I am a regular customer. That really made me happy, so, I got this card for free, essentially. That's why you buy in bulk, my friends, haha. I really love getting my hand on Bob Feller cards. I think I just about have all of the ones that I can afford. 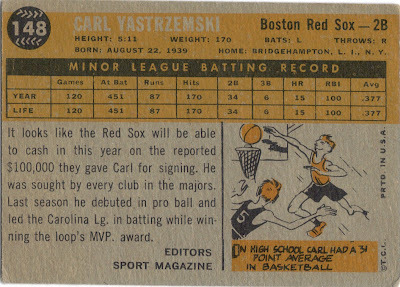 I think I still need his 1953 Bowman, so I'm going to be on the lookout for that, for sure. 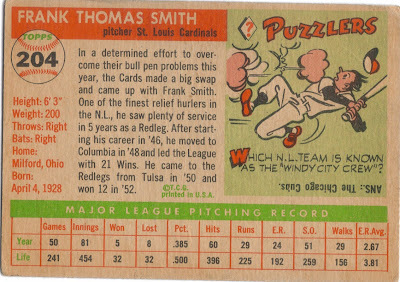 I have noticed that when it comes to Vintage cards, I seem to emphasize pitchers so much more. 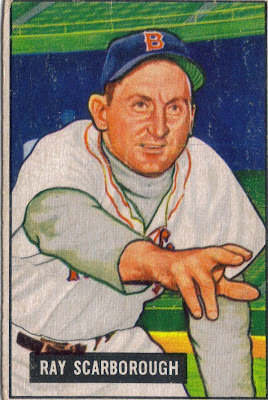 I have player collections going now for Bob Feller and Virgil Trucks and I have always wanted to add more Warren Spahn cards to my collection. I wonder what it is about pitchers that intrigues me? Something else that I picked up at this past weekend's show was this 1951 Bowman Ray Scarborough. His significance is that he was from a small town nearby, Mount Olive, NC. Yes, the pickles come from there (they're great by the way). I first heard about Ray Scarborough from a client/friend of mine who had actually met him in person and then spent time talking with his wife after he had passed away. I thought it was a cool story, nonetheless and when i saw the card, I thought I should grab it. Yes, I also grabbed one for my friend. Switching gears for a bit (see what I did there? ), I thought I'd post something I found while getting all the pictures I intend on hanging on the wall in my new 'man cave' together. I used to watch the movie 'Heart Like a Wheel' every chance I could get when I was little. The movie came out when I was 3 and it was the only drag racing movie I had ever heard of, so it worked for me on a few levels. Since my dad drag raced, I was around it my whole life. 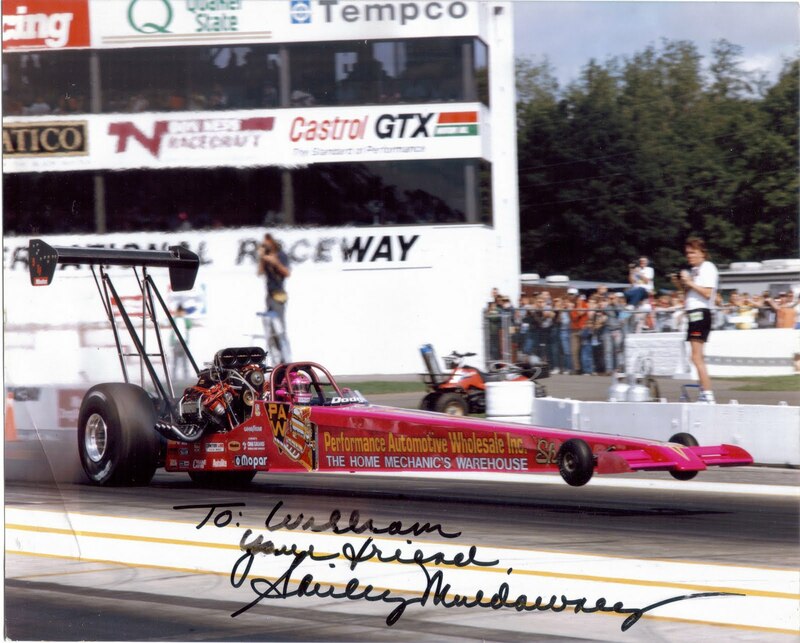 I became a HUGE Shirley Muldowney fan because of the movie. Being the first woman to ascend the professional ranks in drag racing was a tremendous feat, and she was the perfect woman to do it. She has always had the type of 'Take no Sh*t off of anyone' attitude that served her well in being able to send the boys home on raceday. Something else about Shirley is that she has always been very accommodating to her many fans around the world. When I was 10 years old, having seen the movie probably a billion times, my mom found me a way that I could write Shirley a letter. I wish I could remember what I said in the letter. Probably that my dad also drag raced, I loved the movie, etc. I also included my 5th grade school picture and a card of my dad's racecar. 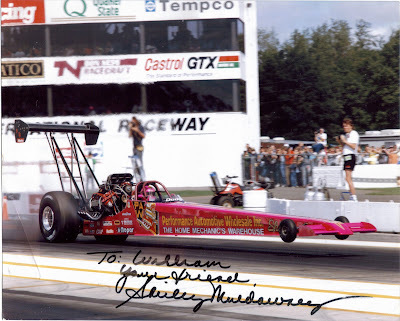 Shirley was racing exclusively on the NHRA circuit at that time, so I didn't have a chance to see her race in person, since we were in IHRA territory. I had always longed to go to a race and watch her, but at that time, I didn't have the chance. Fast forward 5 years (1995), I'm walking along the pits at Bristol Dragway for the 1995 Spring Nationals with my cousin's girlfriend. As we are walking, a top fuel dragster was being rolled out of its transporter. As the car rolls out and I see the name on the car, I flip out and run straight back to our pits and scream at my mom 'MOM OH MY GOD SHIRLEY IS HERE SHES HERE SHES HERE...' (Yeah Im a dork). She had decided to try the IHRA tour that year, so made a (then) rare trip out east. Later on that day when I calmed down, I went up to Shirley to meet her in person. She was sitting at the end of her transporter signing autographs for the people who came by and I was the last one there for that moment. This meant I didn't have anyone waiting behind me so I could talk as long as she allowed. So, I nervously approached the woman I had only read about and seen on TV and told her 'Hello, Ms. Muldowney, I'm a big fan, I loved your movie and I wrote you a letter when I was 10...' She stopped me right there and said 'Your name is William and you sent me a school picture.' I was floored. This awesome lady REMEMBERED me! She REMEMBERED MY NAME! How awesome is that? I will never forget that as long as I live. She is and will always be one of my sports heroes. I hope you all enjoyed this story, as I enjoyed re-telling it. Please leave me some comments and let me know what you think. 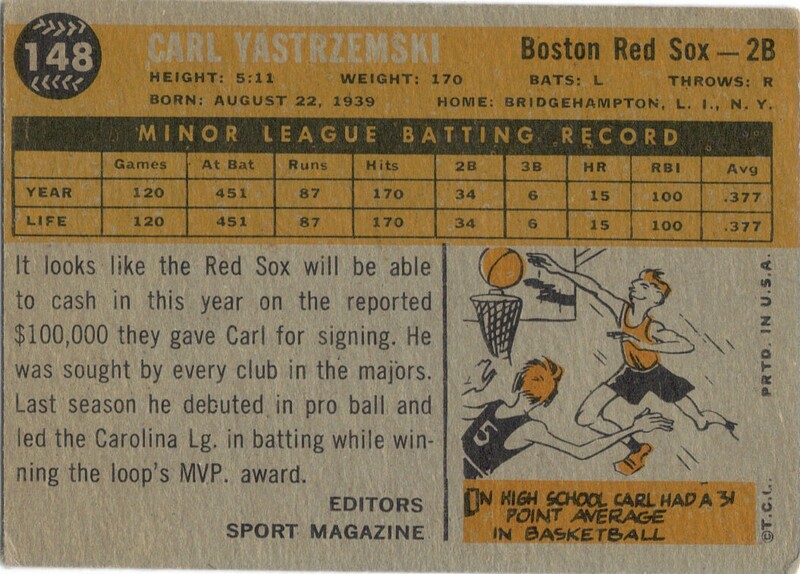 So, we have finally finished the card for card posting of my complete 1955 Topps set. This was definitely a good bit of work and was kind of a chore at times, but I'm glad I did it. I hope everyone enjoyed the posts, I hope they were informative at least. I got a good bit out of it. One of the players who I hadn't heard of before responded to a TTM request (Al Rosen). I began posting this set on October 1, 2010. The final post came on April 23, 2011. Between that time, as far as I know, we lost 3 of the players (Duke Snider, Bertoia and Gus Zernial). I may have missed one or two. If I did, someone please let me know. So, that does it. That just about wraps her all up. I hope you all enjoyed it. I plan on taking a short break from daily scheduled posts (you know, the automatic posts at noon every day) and going back to a more random format for the time being. I do have a couple ideas I'm kicking around for my next project. I also intend on getting back on top of some of my blog features (HOF Spotlight, Hidden in my Collection, etc). I have to say, I'm really happy with how the 1955 posts have increased my follwers and my daily stats. I hope I have convinced some of you to check my blog out regularly and I hope you stick around! Thanks again! I set up as a vendor at the April 23, 2011 Raleigh Card Show today and was very pleased with the results. I got rid of a bunch of loose stuff that was laying around the house (made room in my 'Man Cave'), met up with my good friend P.A. and got a couple things for the collection. The first thing that I will post is the Enos Slaughter autographed baseball. I got this ball for $75 and right after, 3 guys came up and bought $77 worth of stuff. WooHoo, $2.00 ahead!!!!!! Enos Slaughter (b. 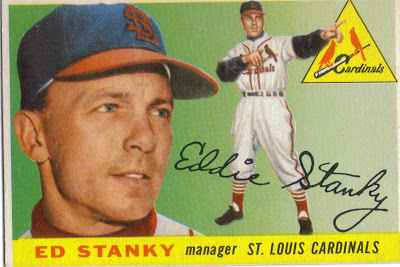 1916 - d. 2002) played in the majors from 1938-42, 46-59 for the Cardinals, Yankees, A's, and Braves. He retired with 2,383 hits, 169 home runs and a .300 batting average. He won the World Series with the Cardinals in 1942 and 1946 and the Yankees in 1956 and 1958. Here it is. 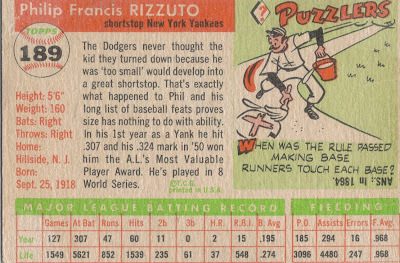 The final card of the 1955 Topps set. 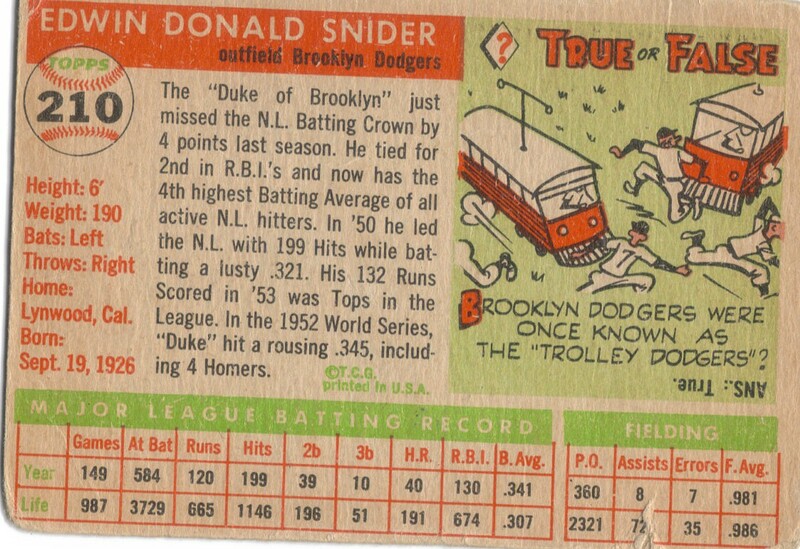 What a way to close it out, though, with the Silver Fox, Duke Snider. Duke Snider (b. 1926 - d. 2011) played in the majors from 1947 to 1964 for the Brooklyn/LA Dodgers, Mets and Giants. 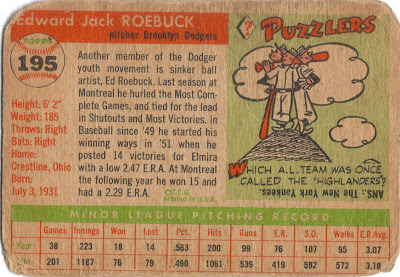 Known as the Duke of Flatbush, he was a huge star for the Dodger teams of the 1950s. He was a World Series winner with the Dodgers in 1955 and 1959. He also appeared in the World Series with the Dodgers in the 1949, 52, 53 and 56 seasons. 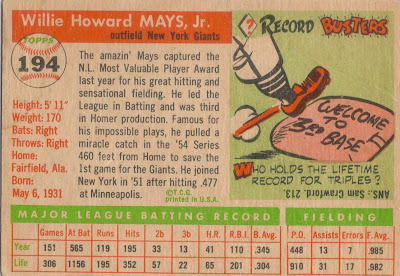 He was a power hitter who hit 40+ home runs in 5 straight seasons (1953-1957). An 8-time All Star (1950-56, 63), he was definitely one of the elite players of his time. He retired at the age of 37 with 2,116 hits, 407 home runs and a lifetime batting average of .295. He was elected to the Hall of Fame in 1980 with 86.5% of the vote (his 11th time on the ballot). Sadly, Snider passed away this February after having been in declining health for some time. 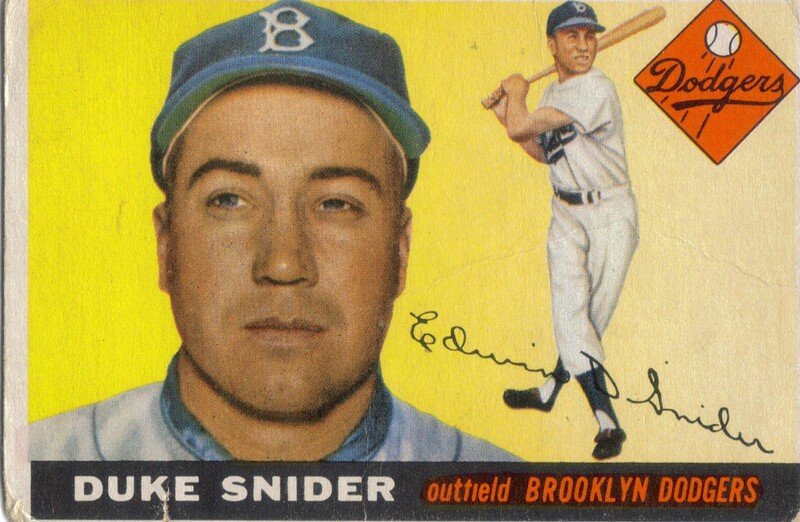 When healthy, Snider was one of the more prolific TTM signers. Not knowing that he was in such poor health, I attempted to have a baseball signed by him TTM in January. I got a RTS and bought a signed ball of his the next day at a card show. 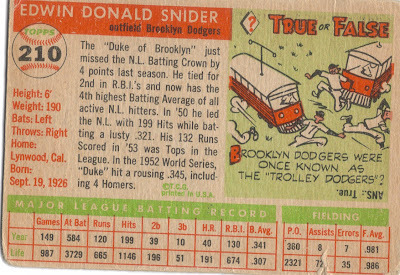 I'm glad I have it because Snider is truly a legend of baseball. 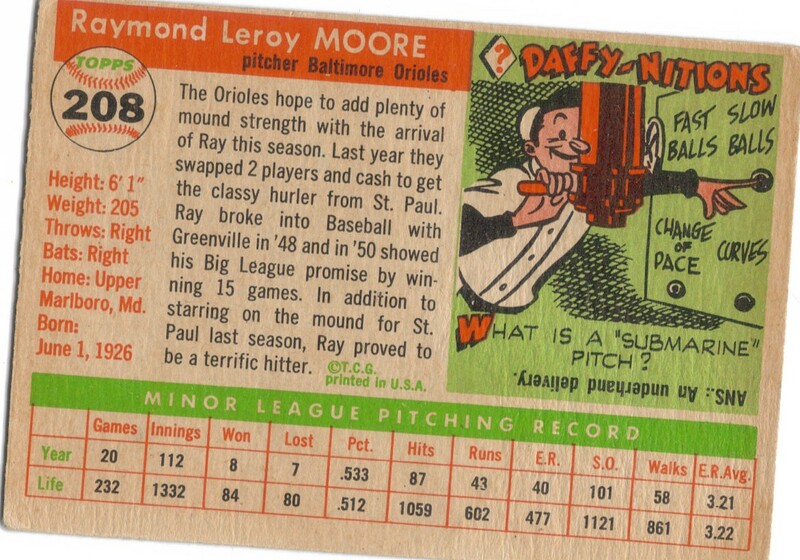 Ray Moore (b. 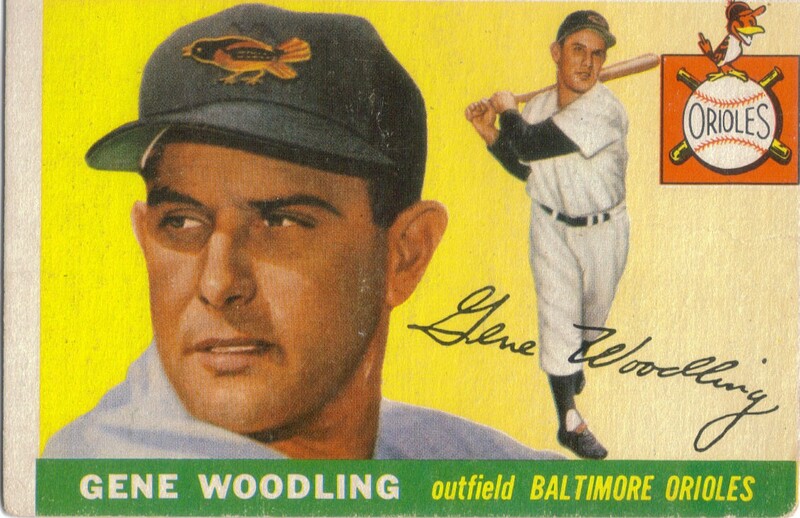 1926 - d. 1995) played in the majors from 1952-53, 1955-1963 for the Dodgers, Orioles, White Sox and Senators/Twins. He retired with a record of 63-59, 612 strikeouts and an ERA of 4.06. Bill Consolo (b. 1934 - d. 2008) played in the majors from 1953 to 1962 for the Red Sox, Senators/Twins, Phillies, Angels and A's. 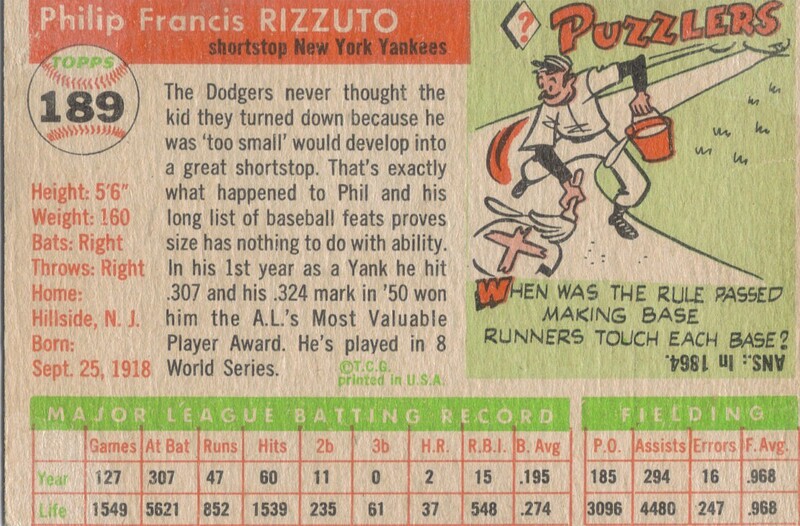 He retired with 260 hits, 9 home runs and a batting average of .221. Pete Daley (b. 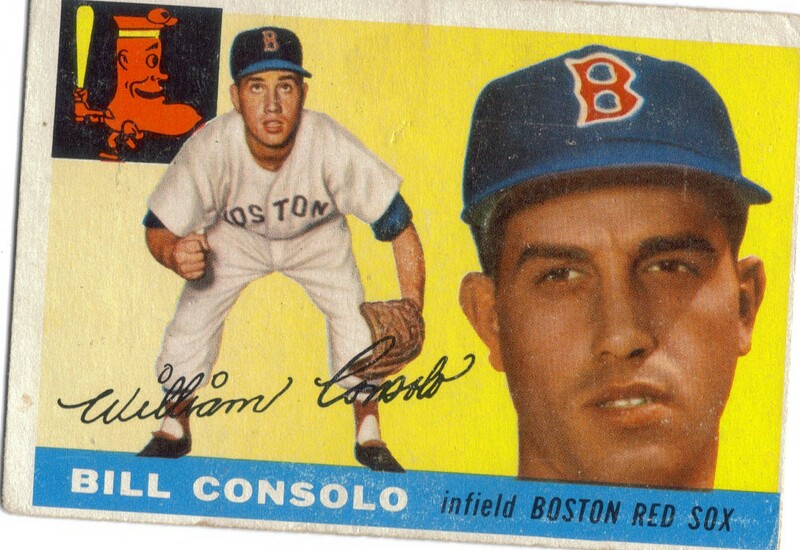 1930) played in the majors from 1955 to 1961 for the Red Sox, A's and Senators. He retired with 259 hits, 18 home runs and a batting average of .239. 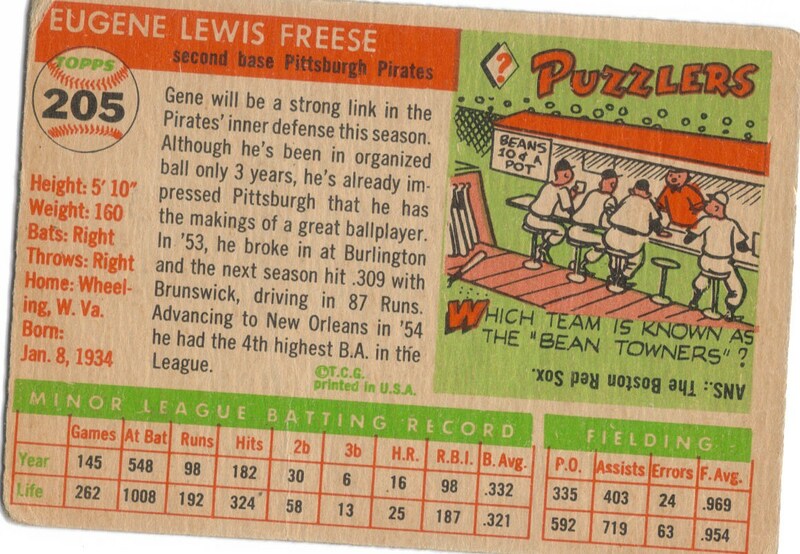 Gene Freese (b. 1934) played in the majors from 1955 to 1966 for the Pirates, Cardinals, White Sox, Reds and Astros. 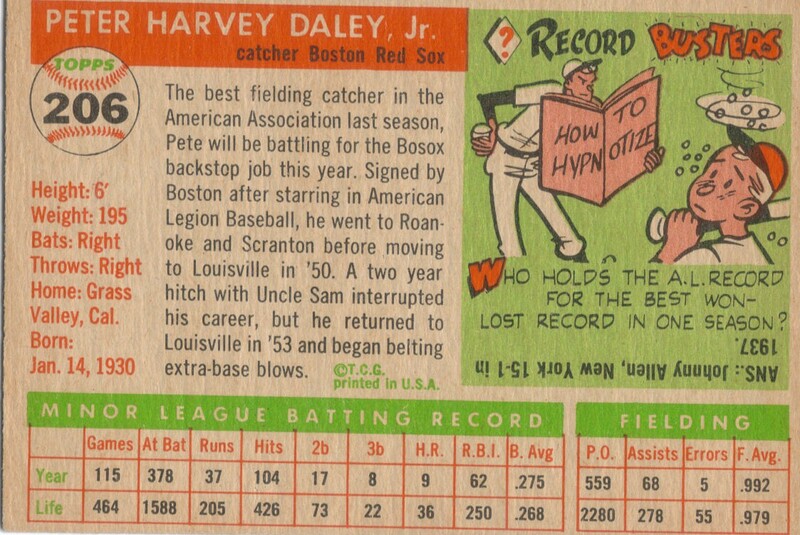 He retired with 877 hits, 115 home runs and a .254 batting average. 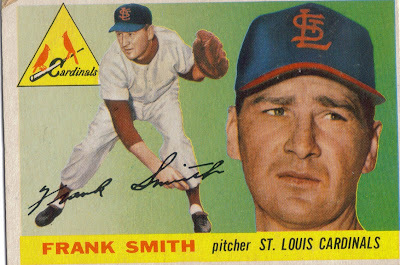 Frank Smith (b. 1928 - d. 2005) played in the majors from 1950 to 1956 for the Reds and Cardinals. 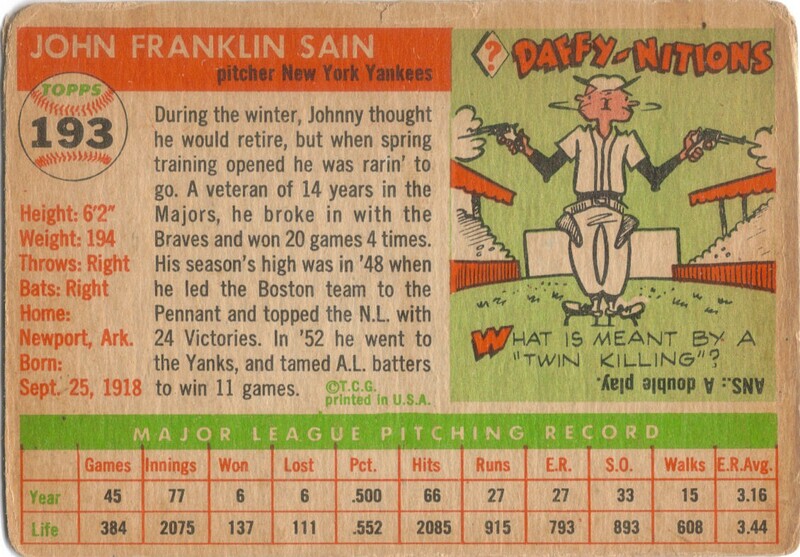 He retired with a record of 35-33, 277 strikeouts and an ERA of 3.81. 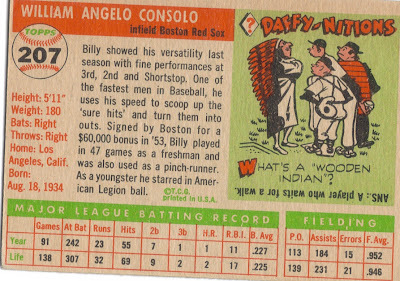 I realize it has been a while since I posted something other than a 1955 Topps card. I have been moving and unpacking at the house, so I haven't had very good access to my cards yet. The room I plan on turning into a man cave has been the staging area for the boxes that will be unpacked and contents of said boxes will be spread throughout the house. This is by far one of the coolest autographed baseballs that I own. I saw it on his official webpage (along with t-shirts that say the same thing) and got a good chuckle out of it. I doubt Rose is truly sorry, as the ball suggests. My good friend P.A. 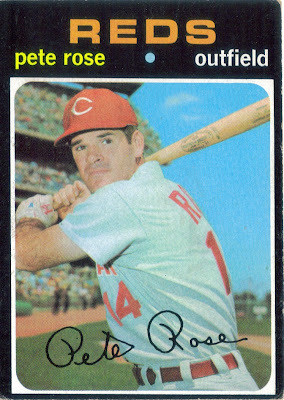 put it in perspective for me several months ago: Pete Rose makes a lot of money sitting across the street from the Hall of Fame every year. The controversy surrounding Rose sells and if he were one day inducted into the Hall of Fame, the novelty of all of this would soon wear off. I agree with P.A. 's point. Rose could just sell baseballs with his autograph on them, but one that says "I'm sorry I bet on baseball" is truly unique among the other baseballs that I own, especially ones with inscriptions. I have no doubt that Rose will one day be in the Hall of Fame, but I believe it will come after he has passed away; just my theory. 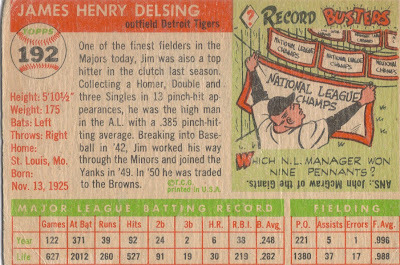 Also, his 746 doubles rank him second all-time to Tris Speaker who had 792. 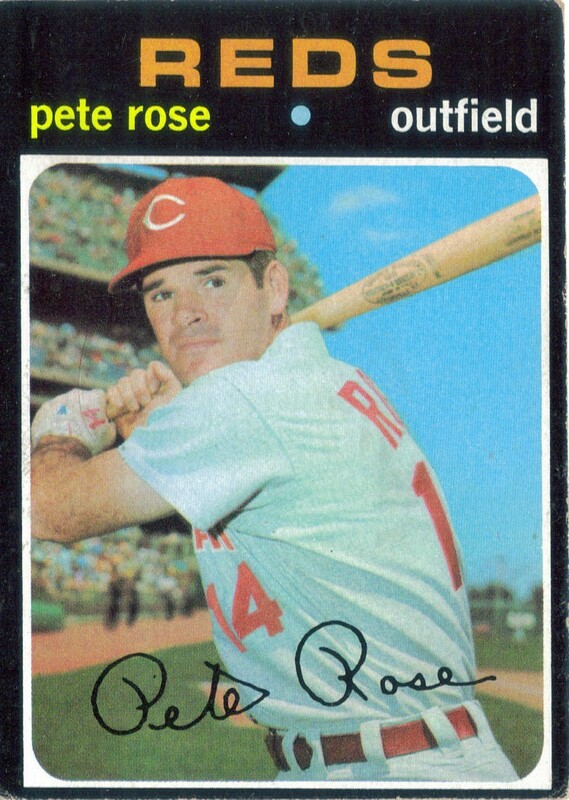 Rose retired with a .303 career batting average which ranks him 174th all-time. Clearly, Rose the player should in in the Hall of Fame, if not Rose the person. His numbers definitely warrant inclusion. That is why I believe he will be in there one day, but, again, it may happen after he is gone. I also believe that Rose knew what he was doing when he signed the agreement with Bart Giamatti banning him from baseball for life. However, the Hall of Fame isn't an affiliation of MLB. They are their own separate entity, but one can understand why they have kept their doors shut to players like Rose, Joe Jackson and Eddie Cicotte, among others. 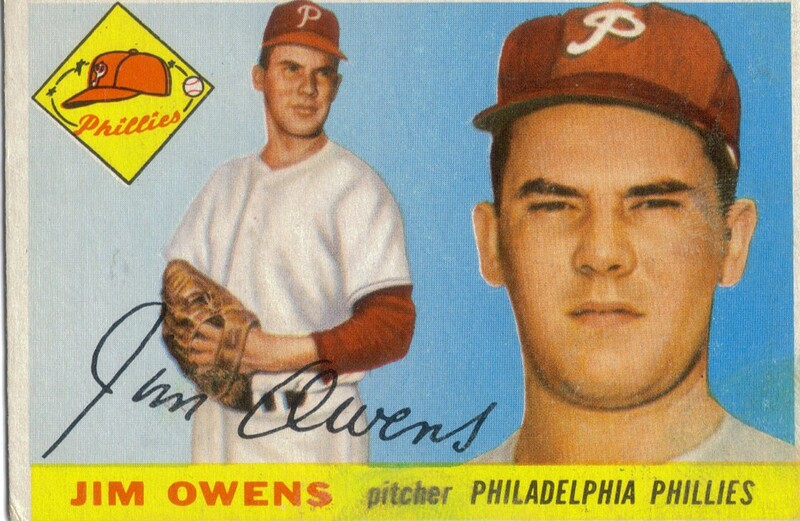 Jim Owens (b. 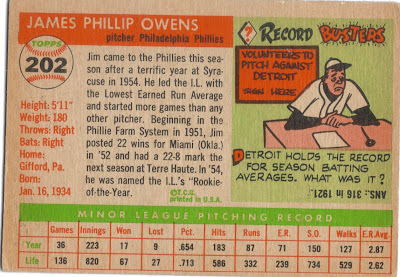 1934) played in the majors from 1955-56, 58-67 for the Phillies, Reds and Astros. He retired with a record of 42-68, 516 strikeouts and a 4.31 ERA. 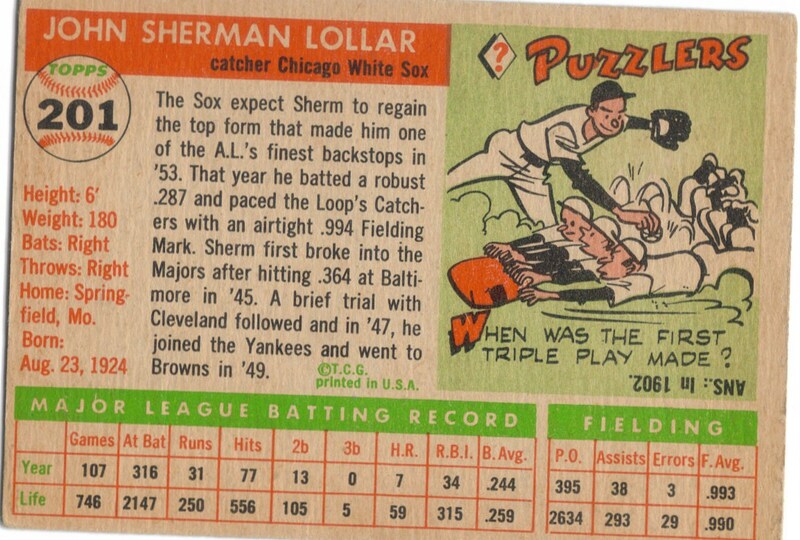 Sherm Lollar (b. 1924 - d. 1977) played in the majors from 1946 to 1963 for the Indians, Yankees, Browns and White Sox. He retired with 1,415 hits, 155 home runs and a batting average of .264. 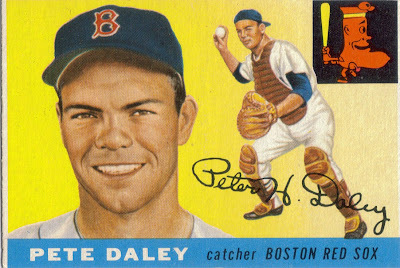 He was an All Star in 7 seasons (1950, 1954-1956 and 1958-1960) and won the Gold Glove 3 times (1957, 58, 59). 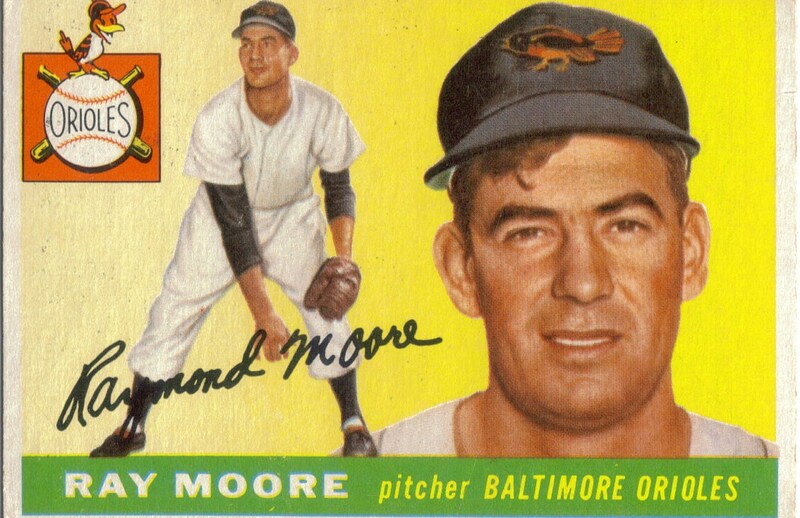 He also won the World Series with the Yankees in 1947 and was on the Orioles' coaching staff when they beat the Dodgers for the 1966 World Series crown. 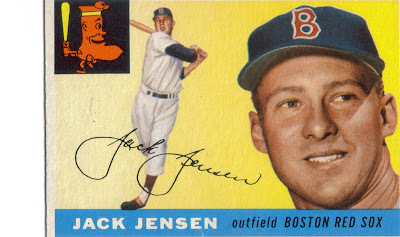 Jack Jensen (b. 1927 - d. 1982) played in the majors from 1950-1959 and 1961 for the Yankees, Senators and Red Sox. 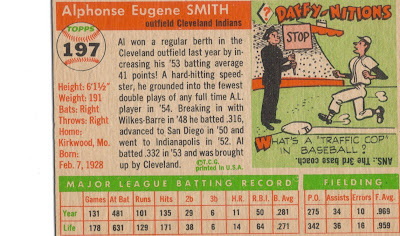 He retired with 1,463 hits, 199 home runs and a .279 batting average. 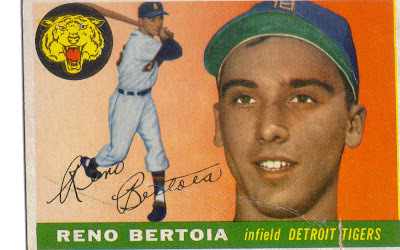 He was voted the MVP of the AL in 1958 after putting up 157 hits, 35 home runs, 122 RBI and a .279 batting average. 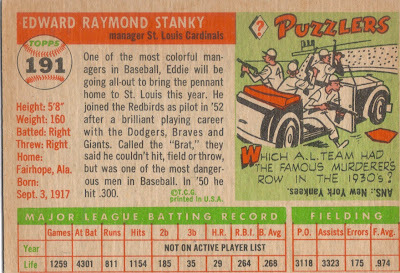 He retired at an early age as baseball expanded westward due to an intense fear of flying and also because he did not like being separated from his family. You have to respect that, for sure. 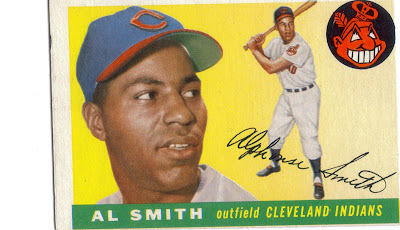 Al Smith (b. 1928 - d. 2002) played in the majors from 1953 to 1964 for the Indians, White Sox, Orioles and Red Sox. 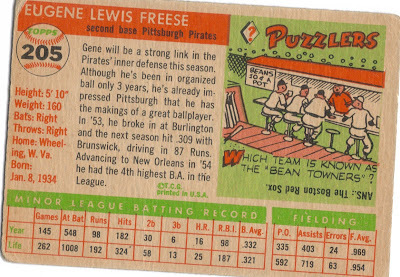 He retired with 1,458 hits, 164 home runs and a .272 batting average. 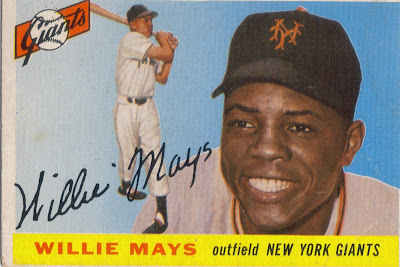 He was a 2-time All Star (1955 and 1960) and finished as high as 3rd in MVP voting for the AL (1955). What's special about this post? Well, this will be the first blog entry from my new house! I got my internet set up today, complete with a wireless router so I can use my old desktop PC and Laptop simultaneously. Wooo, welcome to 2007! It takes me a while to catch up. I'm especially excited that I can finally hook my Wii up via wireless and download old school games and use it to it's intended purpose. Also, once my 'man cave' is set up, there will be a lot more 'Hidden in my Collection' posts to come. 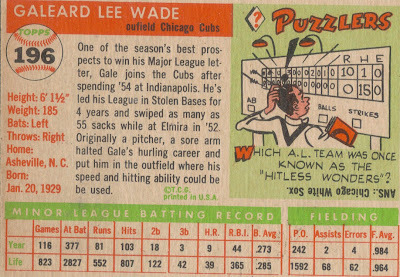 Gale Wade (b. 1929) played 2 seasons in the majors (1955 and 1956) for the Cubs. 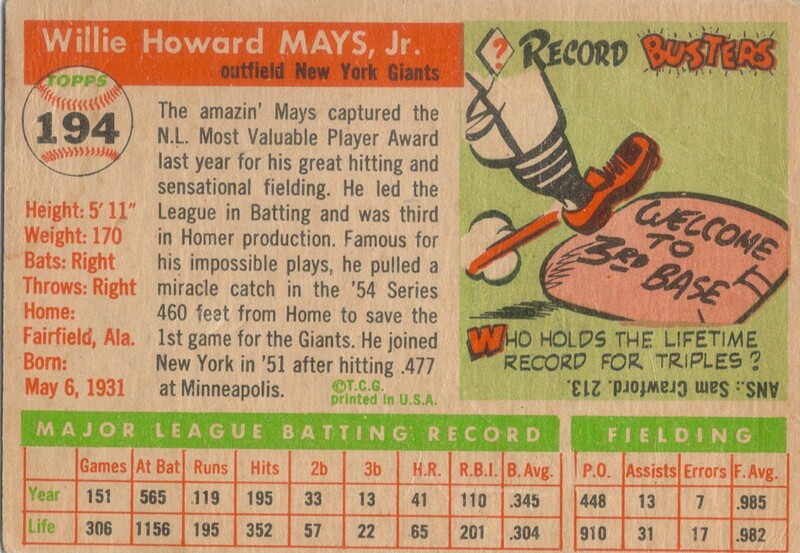 He had 6 hits, one home run and a .133 batting average. Yes the corners of this card are VERY rounded. I think I need to upgrade this one sometime soon. Ed Roebuck (b. 1931) played in the majors from 1955-1958, 1960-1966 for the Dodgers, Senators and Phillies. He retired with a record of 52-31, 477 strikeouts and an ERA of 3.35. 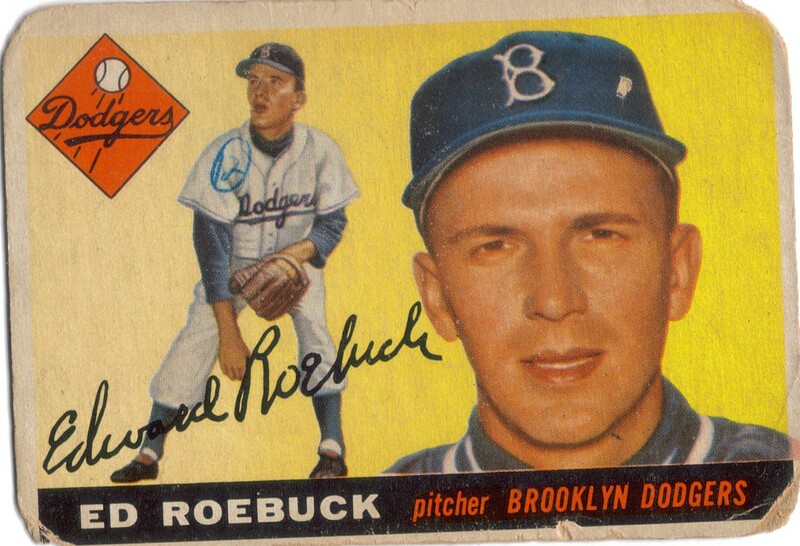 He was a member of the 1955 World Champion Dodgers. 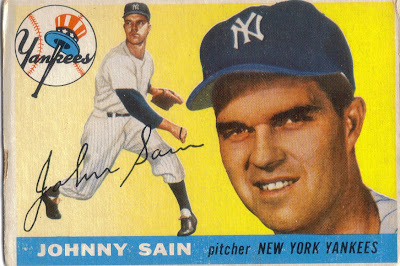 Johnny Sain (b. 1917 - d. 2006) played in the majors from 1942, 1946 to 1955 for the Braves, Yankees and A's. He retired with a record of 139-116, 910 strikeouts and an ERA of 3.49. 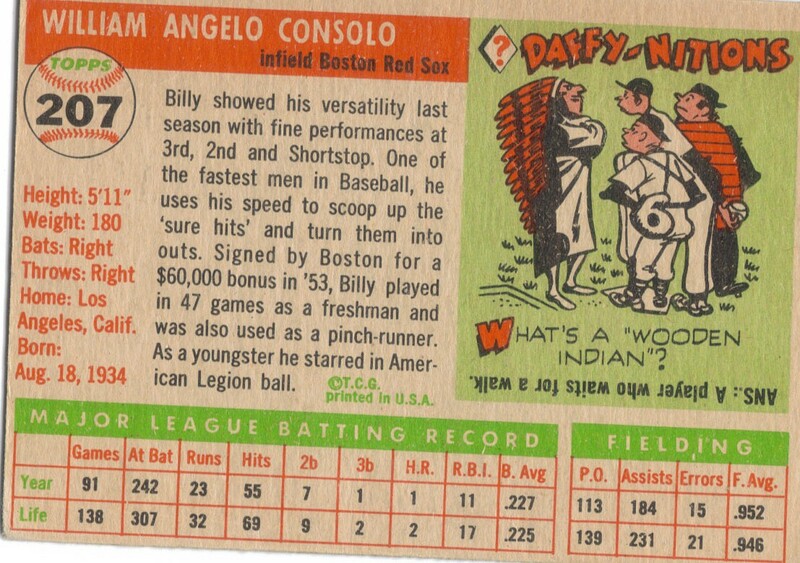 He was an All Star in 1947, 1948 and 1953. He led the league in wins in 1948 with 24 and won the World Series with Yankees in 1951, 1952 and 1953. 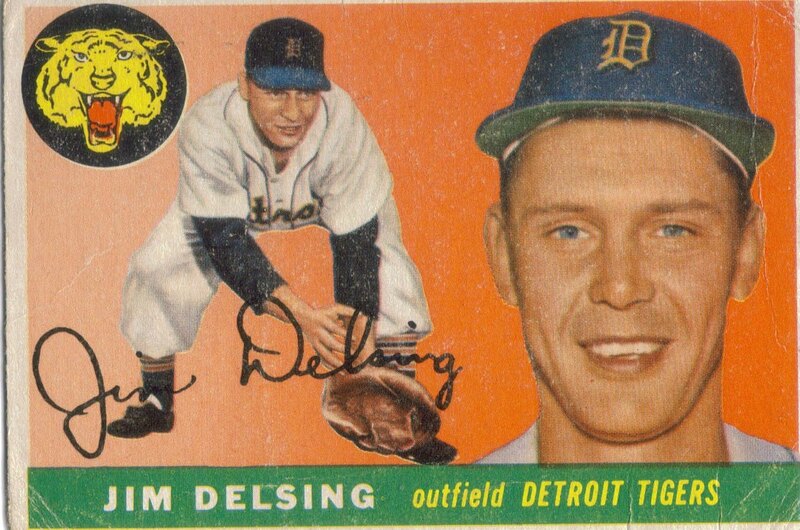 He also won the World Series as a coach for the Yankees in 1961 and 1962 and the Tigers in 1968. Jim Delsing (b. 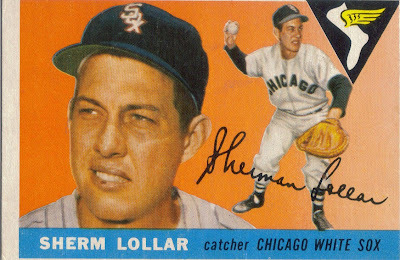 1925 - d. 2006) played in the majors from 1948 to 1956 and 1960 for the White Sox, Yankees, Browns, Tigers and A's. He retired with 627 hits, 40 home runs and a batting average of .255. 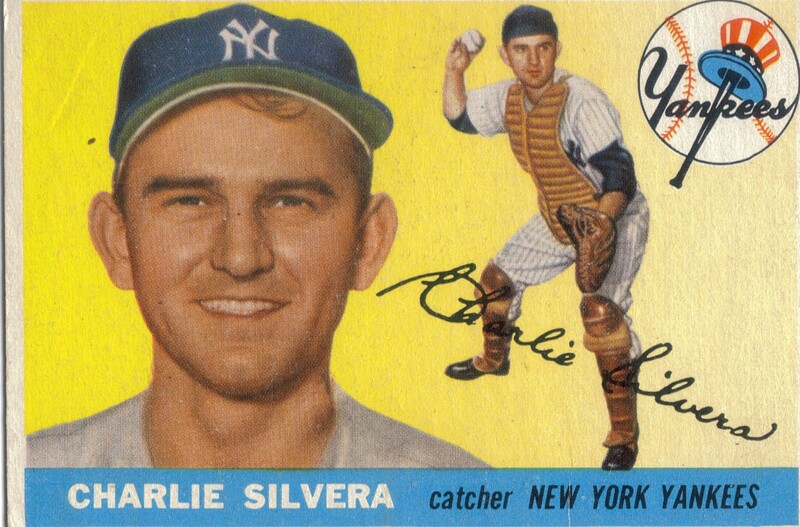 He was a member of the 1949 and 1950 World Champion Yankees. 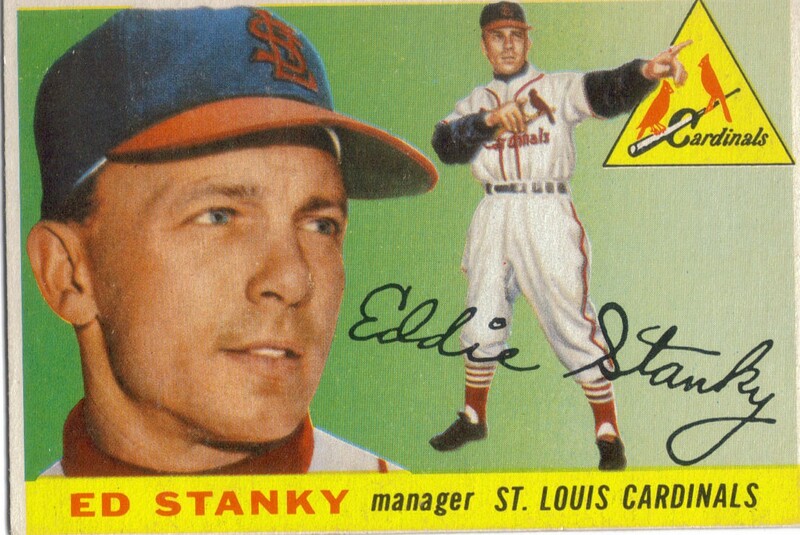 Eddie Stanky (b. 1916 - d. 1999) played in the majors from 1943 to 1953 for the Cubs, Dodgers, Braves, Giants and Cardinals. 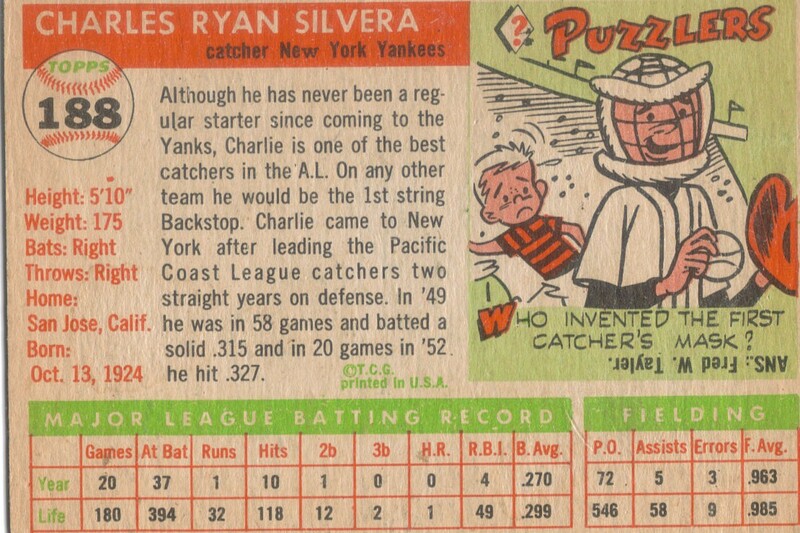 He retired as a player with 1,154 hits, 29 home runs and a .268 batting average. 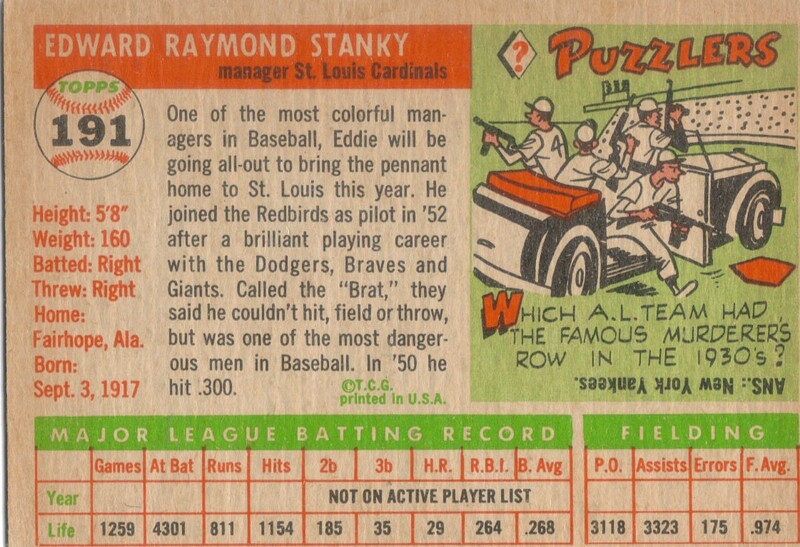 He became a player/manager for the Cardinals in 1952 and 1953 and continued as their manager until 1955. 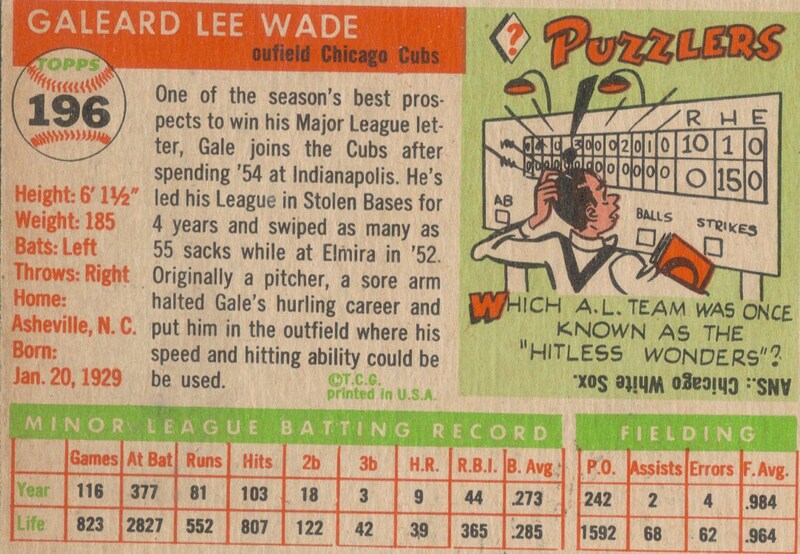 He also managed the White Sox from 1966 to 1968 and the Rangers in 1977. He retired as a manager with a record of 260-238. 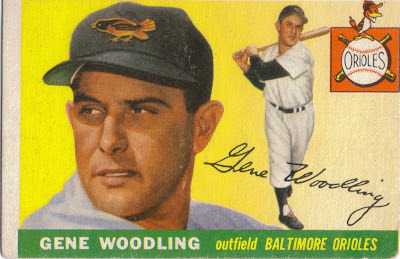 Gene Woodling (b. 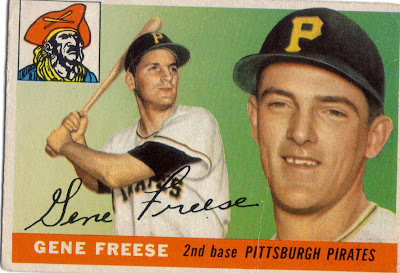 1922 - d. 2001) played in the majors from 1943, 1946-1947 and 1949-1962 for the Indians, Pirates, Yankees, Orioles, Senators and Mets. 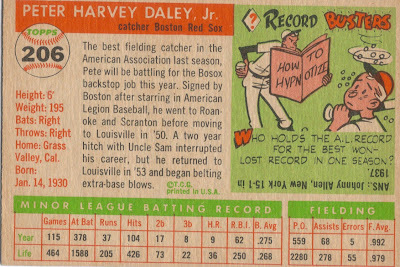 He retired with 1,585 hits, 147 home runs and a .284 batting average. 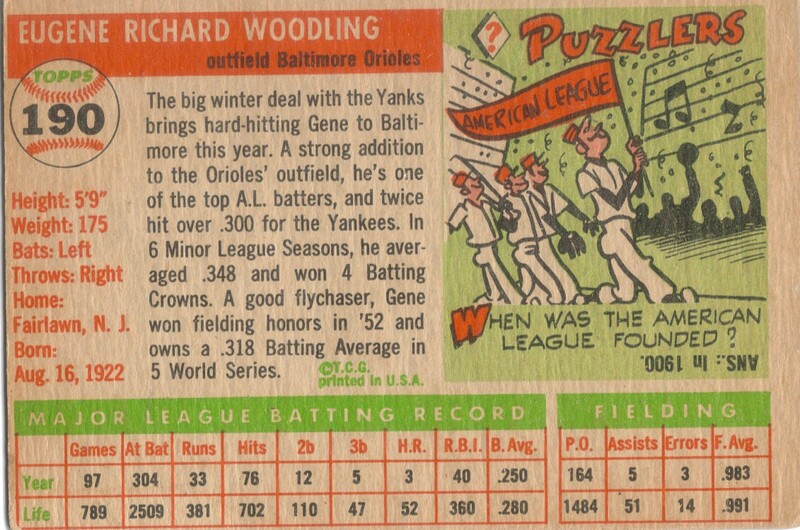 He was an All Star in 1959 and was a World Series Champion 6 times (1949 to 1953 - Yankees and 1966, coaching for the Orioles). 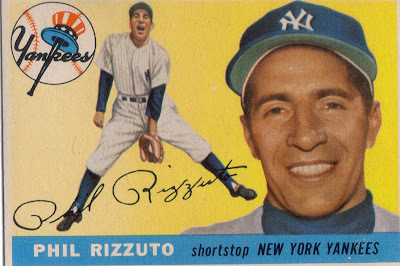 Phil Rizzuto (b. 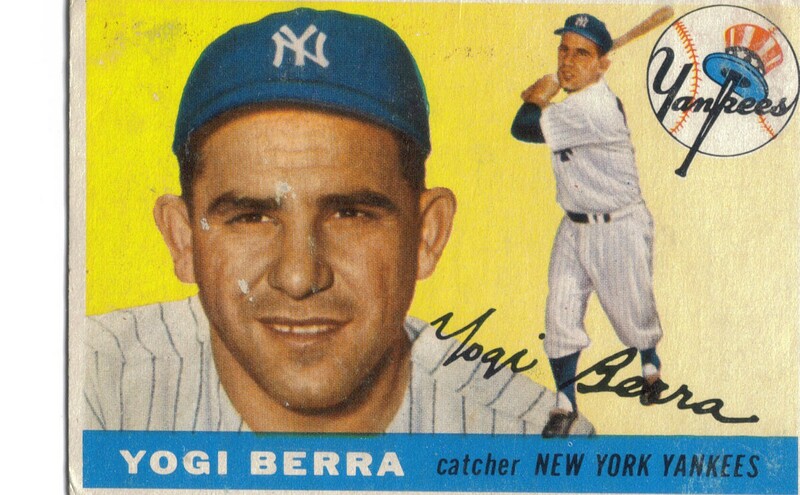 1917 - d. 2007) played in the majors from 1941-1942, 1946-1956, all for the Yankees. He retired with 1,588 hits, 38 home runs and a .273 batting average. He was the 1950 AL MVP and was a member of 7 World Series Champions (all with the Yankees of course - 1941, 1947, 1949-1953). 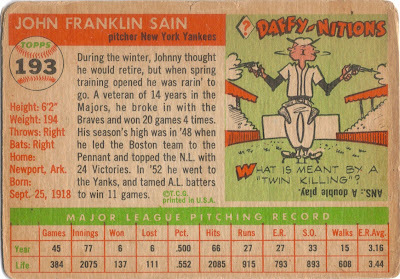 He was also an All Star 5 times (1942, 1950-1953). 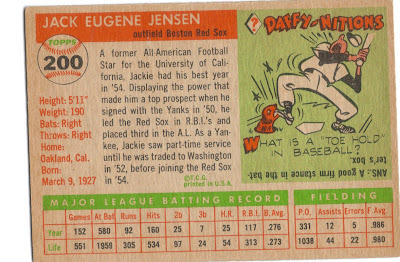 He was elected to the Hall of Fame in 1994 by the Veterans' Committee. 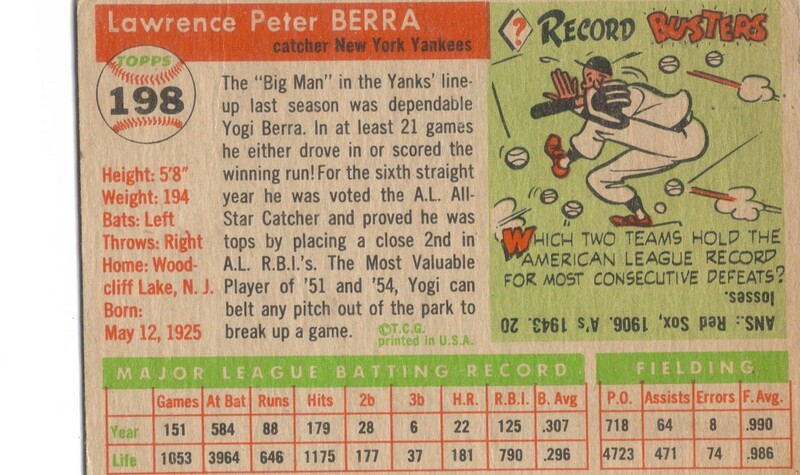 I sincerely doubt that he would be in the Hall if he played for anyone other than the Yankees. 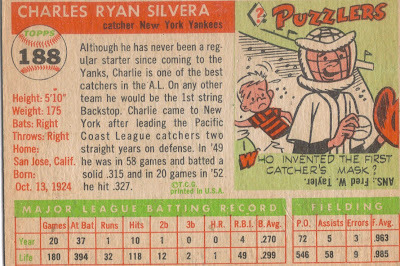 Charlie Silvera (b. 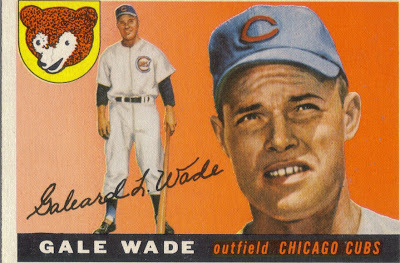 1924) played in the majors from 1948 to 1957 for the Yankees and Cubs. 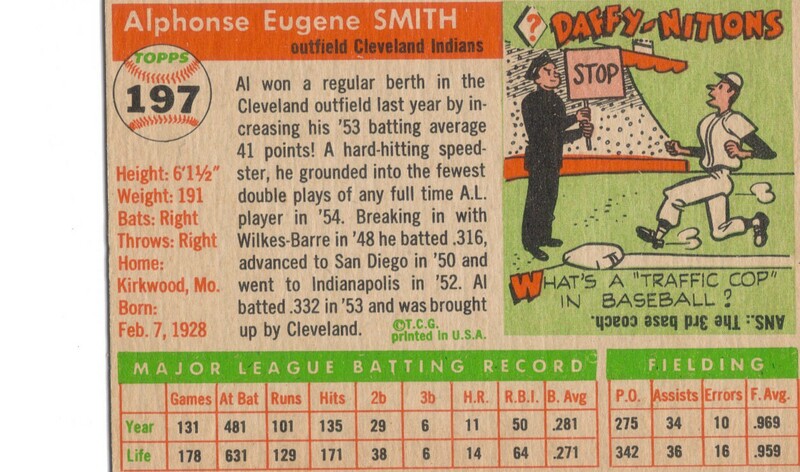 He retired with 136 hits, 1 home run and a .282 batting average. 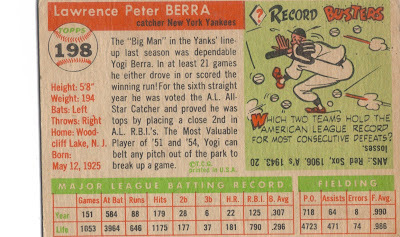 He was a membe rof the World Series Champion Yankees in 1949-1953 and 1956, however, he only appeared in the 1949 World Series (one game, 2 at bats, with no hits). The pictures don't begin to do it justice, but we had a blast at Wrestlemania 27, in Atlanta. The place was packed (71, 617 people), and the show was great. I took pictures of what was on the video screens instead of the actual ring because it was so far away. I think it ended up working out. Here you can see CM Punk taunting Randy Orton. Punk would end up losing, though, but it was a decent match. It never gets old seeing Stone Cold give someone the Stunner. Here, you can see him delivering one to Booker T.
After a grueling match against my favorite wrestler, HHH, Undertaker raised his Wrestlemania record to 19-0. Finally, the Miz won the main event over John Cena. I can't stand Cena, so I was happy to see him lose. I'd write more, but we are exhausted. We had a great time, though, and the most important thing is that my son, Christopher, had a blast. He really had a great time and thanked me several times for bringing him... That made the whole trip worthwhile. The Great Reorganization: Step 36: Giving It Up is Hard to Do! Buddy the Elf, what's your favorite color? David Ortiz Relic, Patch, and Autograph Collection.